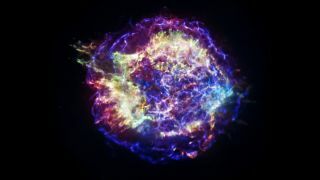 Buried under layers of glowing, multi-colored gas, at the heart of supernova remnant Cassiopeia A, are massive caverns carved out by radioactive metal, according to new research. Bubbles of radioactive metal may have punched holes in the heart of a nearby supernova, according to new observations. The inner layers of Cassiopeia A, a supernova that exploded 340 years ago, bears evidence of enormous caverns, where material has been cleared away. The authors of the new research theorize that expanding bubbles of radioactive nickel could have created the holes. Dan Milisavljevic, a postdoctoral researcher at the Harvard Smithsonian Center for Astrophysics, wants to know why stars explode. He's studying the scene of a nearby stellar detonation: Cassiopeia A, located a mere 11,000 light-years from Earth, in the Milky Way galaxy. "We're like the bomb squad," Milisavljevic says. "A bomb's gone off and I want to understand how that bomb exploded. So when I go in the room, the first thing I'm going to say is: Where did the debris go? Did it go in all directions equally or did it go in some directions preferentially, like a pipe bomb or something? That's step one. And that's what we've done here." The new paper by Milisavljevic and his co-author Rob Fesen of Dartmouth College, show that the wreckage of Cassiopeia A is not scattered arbitrarily. In its core there are cavernous structures that indicate a deliberate process. Data from the new observations show the structure of the two largest cavities inside Cassiopeia A. The colors provide an idea of the 3D structure of the material: the blue regions indicate material expanding away from Earth, while red indicates material moving toward. Images of Cassiopeia A, or Cas A for short, taken by optical telescopes show a beautiful, multicolored shell of material around the former star. This material is lit up by energy from a shock wave that emerged during the initial explosion. Astronomers have trouble looking inside this shell, to the core of the explosion, because so many layers of dust surround it, and because it doesn't radiate as much light. Milisavljevic and his co-author used a specialized instrument to look at Cas A through the Mayall 4-meter telescope at the Kitt Peak National Observatory. They looked for near-infrared light — which can penetrate dust — in a very small range of wavelengths. This region of light is sensitive to sulfur, which is common in Cas A. It turns out, the scientists were looking in just the right place. The sulfur they observed in the inner regions held the shape of the bubbles, the way mud holds the shape of a footprint. They saw hollowed out caverns, as if the bubbles had pushed other material to the side, then popped and disappeared. A telescopic image of Cassiopeia A is overlaid with data from the new observations that show the structure of the cavities inside the supernova remnant. The shaed of blue indicates how quickly the material is moving away from Earth, with dark blue moving fastest. The panel to the right shows the view angled 70 degrees. The researchers believe the bubbles were formed by radioactive nickel. Once the star exploded, the material that made up the star's body began to hurtle outward. The new research and some previous work suggests that the dollops of radioactive metal would have moved out into this expanding cloud. The radioactive decay of that atoms would produce photons that would push outward on the surrounding material, forming the bubbles. A few weeks after the explosion, the bubbles would have become a permanent feature. In addition, the researchers say the bubble theory could explain larger structures in Cas A, namely, large rings seen by optical and infrared telescopes in the outer regions of the remnant. If radioactive nickel did create the bubbles, it would no longer be present in Cas A's remains — it will have decayed, or broken apart. But it may have left behind deposits of iron. Milisavljevic said the next step in confirming the theory will be searching for those iron deposits. Previous research has shown that nickel deposits could move faster than lighter elements as all the material hurtles outward after the blast. This is consistent with the new findings. The presence of the nickel bubbles could also indicate that material moves around inside the star before it explodes. According to Milisavljevic, prior models of stars just before they exploded into supernova usually painted a picture of a very tidy interior: all the elements remained separated into layers, with the lightest elements like hydrogen and helium on top, then carbon and oxygen, and finally iron. But scientists are beginning to think that things may actually be much messier. "It may be that the star is quite turbulent inside," Milisavljevic said. "So it's not this onion skin interior. There may be some kind of mixing that's going on in the chemical layers of the star immediately prior to the explosion. And simulations have shown that if that's the case, then the explosion proceeds much more easily and that may be aiding in the explosion all together." By studying the bubbles, scientists may get new clues about what happens inside a star as it is about to end its life with a brilliant bang.